We were proud to once again come on board with the women’s Perth Scorchers as the team’s Principal Partner for the WBBL|04 season. 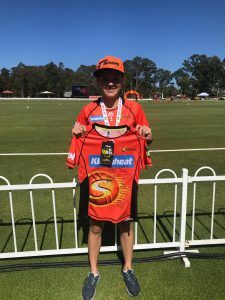 The partnership between Kleenheat and the Scorchers is based on a foundation of shared values across diversity and inclusion, with the Scorchers’ mission to ensure cricket is established and recognised as a sport for all Australians – especially women and girls. This is well aligned to Kleenheat’s commitment to drive gender equality in business and the community and grow leadership opportunities for women. While the ladies missed out on the finals this season, it was a great thrill to join forces with them, cheering every boundary and wicket along the way. After a tough season, we’re sure the team are looking forward to enjoying the rest of WA’s summer. We caught up with players Megan Banting, Chloe Piparo and Mathilda Carmichael to find out what they’ll be getting up to! This season, Kleenheat brought the fun and energy to home games across the season with a ‘Plinko’ game station. We had a great time meeting our fellow Scorchers’ fans, giving away hundreds of prizes and demonstrating our commitment to WA home teams. A few lucky fans also won the chance the toss the coin at home games and walked away with signed jerseys! The fun continues – win tickets! The women’s season may be over but thanks to our partnership with the Perth Scorchers, we’re giving away 15 double passes to the men’s game at Optus Stadium on Sunday 3 February! Get your entry in and you could be in the stands cheering on our local team. Competition is exclusive to Kleenheat customers, closing 2:00pm on Monday 28 January 2019. My wife and me are cricket fans and have been cheering our local team both the women”s and the men”s from our lounge and would love to watch it live at the stadium and hope my name is picked. Glad to see support for our local team Joseph! We hope you guys get to catch a match too! It would be great to celebrate the Scorchers!! We agree! Nothing like watching them live in action. Definitely worth heading down to watch a game! Love the cricket, the fans and the stadium! Glad to see support for our home team!